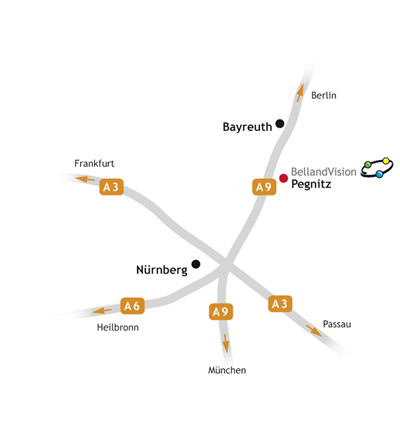 Pegnitz is located directly on the A9 motorway between Nürnberg and Bayreuth. Leave the motorway at the Pegnitz (44) exit and follow the signs for Pegnitz. On entering Pegnitz you will be on "Nürnberger Straße". Continue along this road, go straight ahead at the roundabout and turn into the "Galgengasse" on the right after the Aral petrol station. Follow the roads "Alter Graben" and "Schlossstraße". Turn right at the end of "Schloßstraße" into "Bahnhofstraße" and turn left after crossing the train tracks. Continue approx. 200 m and the BellandVision building is on the right. The distance from the motorway exit is around 5.8 km in total. Pegnitz is located directly on the train route between Nürnberg and Bayreuth. Leave the train at "Pegnitz Bahnhof" station. Regular shuttle services operate in both directions throughout the day. BellandVision can be reached easily by foot from the station: Keep right and follow "Bahnhofstraße" for approx. 300 m. The BellandVision building is on the opposite side of the road. Is your Packaging System Participation obliged?